Welcome! How is your summer going? It has been a crazy weather spring for which I'm very grateful. One week it will be really hot, and the next it will be cooler with opportunities to catch up on yard work and let nature take care of watering the plants. I've been out in my yard most of the week getting ready for next week's high temperatures. I love seeing all the amazing things that my guests do in their homes to spruce up for summer. We're on to week 4 in the Summer Home Tour Series and I'm so excited to share the amazing home of my next guest! Have you met Amy Dowling? If not, you are in for a treat! Every interaction I've had the pleasure of having with her has been such a positive and uplifting experience, so I was thrilled when she agreed to share in this series! 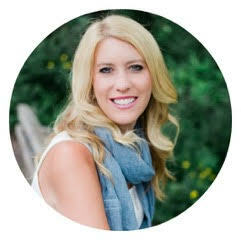 Amy blogs over at My Life From Home where she shares an amazing array of ideas. From DIY, to decorating, to recipes, to fashion, she makes it easy to learn how to love living in our own home. Don't forget to check out her beautiful blog at the end of this post, but be prepared to stay awhile, you will want to see all she has to share. So, let's meet Amy, shall we? Hello! I am Amy and I blog at My Life From Home. Thank you, Michele, for having me! I'm thrilled to be a part of this summer's tour! My blog is a combination of home decor, crafts, recipes, and fashion. My desire is to inspire others to live their lives to the fullest at home. Home to me is a happy and inspiring place where I enjoy spending time with my loved ones. I feel your home should be a reflection of you, your journey, your memories, and your style. I love all things with a history and I fill my home with things that are meaningful and inspiring to me. I would sum up my style in three words: vintage, cozy, farmhouse. I've been lucky to inherit a lot of pieces and enjoy putting them to use in my home. I like a clean, fresh pallet with pops of greenery and color in subtle ways. A standard color throughout the home is black. My floors are black and I have pops of black through fixtures and accessories throughout my home! Are you ready to come in? We recently did a front porch refresh and you can catch up on that here and here. As you enter the home, we have a small foyer which has a travel gallery wall and barn style doors on our pantry. Our office has a gallery wall with maps of favorite places we've been and my vintage camera collection. I recently bought this headboard bench from a French Market Sale. I saw this and just could not resist it. I literally rearranged the whole room to accommodate this new purchase. Can anyone else relate? With neutral throw pillows and a stack of books on one side, it is the perfect spot to read a book or enjoy the sunshine pouring in. Next, we will head into the dining room, where I have set my table for you in my summer tablescape. I used galvanized chargers that are great for indoor or outdoor entertaining. Paired with that, mismatched white plates, antique bowls and linen napkins. Using my olive bucket, I put together an arrangement of white, green, and crimson flowers. A perfect setting for a luncheon or tea! Another spot which gets some summer touches is my fireplace. I used another olive bucket to house a fern. My mantel is my spring mantel scheme which has a bird theme using a bird's nest in a milk glass dish, antique bird prints, a birdhouse wreath and a tobacco basket. 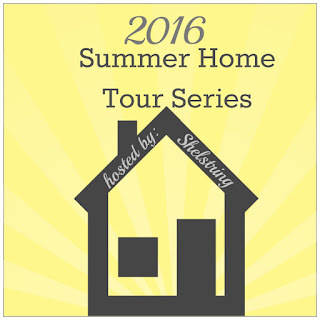 I want to thank you again for joining me today on my summer home tour. It was a pleasure spending time with you today! To life feeling like home! Isn't Amy's home so fresh and inviting? As with the other homes I've shared this month, it's hard to pick a favorite, don't you think?! Or was it easy for you? What did you love the most? Now you can check out her amazing projects including her recent one room challenge results and DIY plaque yourself. Who doesn't love a quick and easy project that makes a big impact? But remember to come back for another beautiful summer home tour to see how Colleen from Life on Kaydeross Creek.